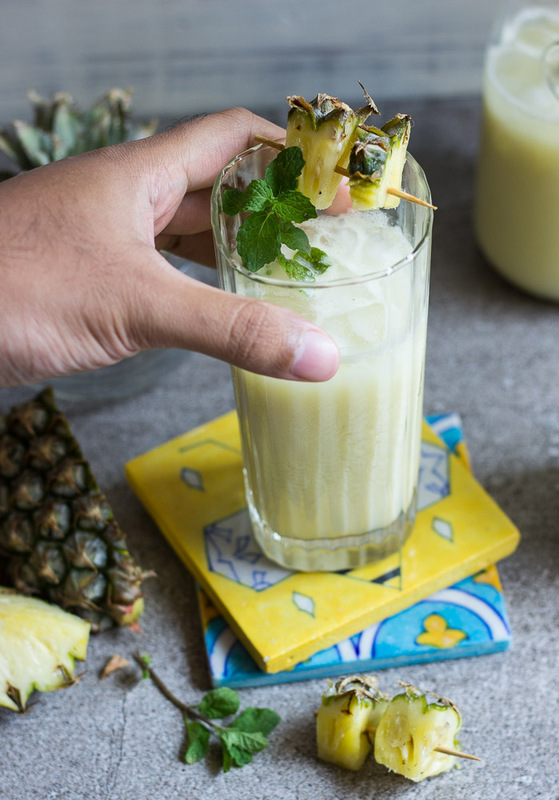 I was experimenting with this pineapple lassi a few days ago, not with the ubiquitous sweet version, but a savoury one. 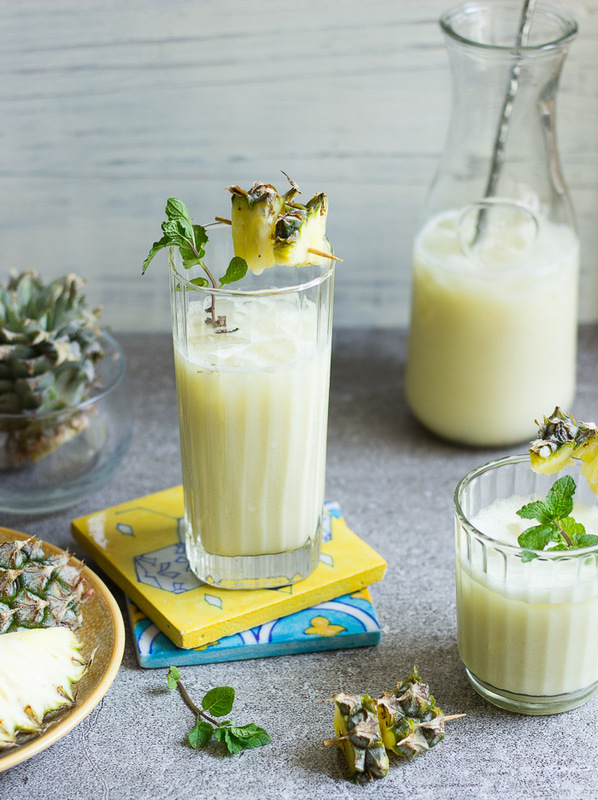 The flavours are what you would expect with a typical ‘salt’ lassi: cumin, mint, and salt. The addition of fruit is the wildcard ingredient here. I always add a pinch of salt to most sweet lassis to balance out their flavour so I knew beforehand that even if this experiment goes awry, adding a little sugar or honey (as I often use) would salvage it. Calculated risks you see. I can’t put my finger on what it is that works so well here – do pineapples have enough sweetness in them that requires no addition of extra sugar? Or, like green mangoes, do they have a certain savoury quotient that works well with salty notes? Admittedly, there aren’t too many savoury fruit lassis out there simply because I don’t think most fruits would work well without the addition of some sweetness, but just off the top of my head – roasted beets, green mango, maybe cucumber? I used homemade yogurt here, but any shop-bought kind would do too. It’s hard to ascertain how much yogurt and water you would require since that would largely depend on how thick your yogurt is, so first blend the yogurt without adding extra water, and then loosen out as you go. Grind the cumin seeds to a fine powder either using a mortar and pestle or a blender. If using a mortar and pestle, adding a pinch of coarse salt helps with getting the seeds ground quicker. Add yogurt, pineapple, cumin powder, salt, mint leaves and salt to a large blender jar and blend until smooth. Taste and add more salt or cumin if required. If the lassi is too thick, add a little water and blend again. 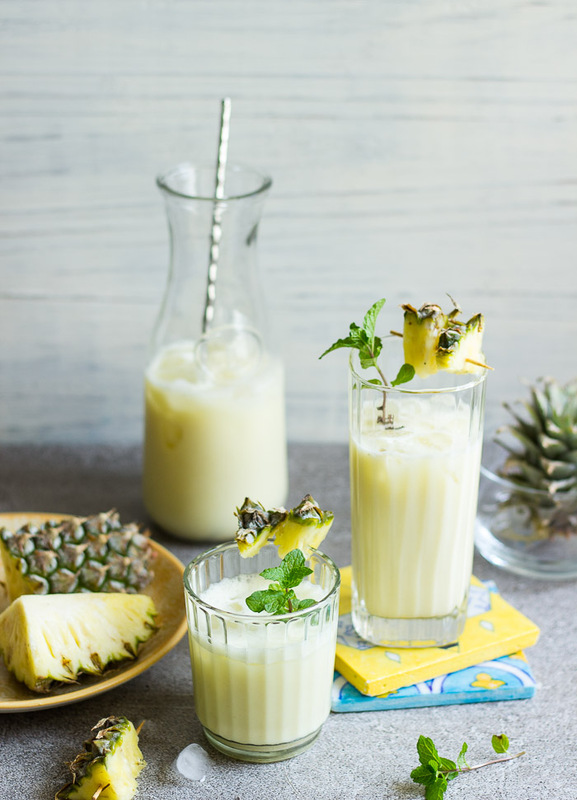 To serve, add ice cubes to glasses and top with the lassi.